General Tom Hobbins is commander, U.S. Air Forces Europe; commander, Air Component Command, Ramstein; and director, Joint Air Power Competency Center, Ramstein Air Base, Germany. 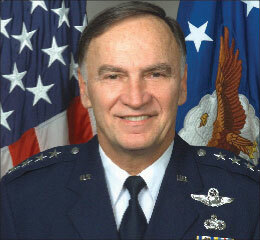 Hobbins entered the Air Force in December 1969 as a graduate of Officer Training School. He has commanded two tactical fighter wings and a composite air group. He has served as the Director of Plans and Operations for U.S. Forces Japan, Director of Plans and Policy for U.S. Atlantic Command, and the Director of Operations for U.S. Air Forces in Europe. As the USAFE Director of Operations, General Hobbins was responsible for the planning, beddown and execution of combat forces in Europe for Operation Allied Force. While serving as commander, Air Forces Iceland, he led the composite wing in the intercept of 80 Soviet bomber aircraft in nine months. During his tenure as 12th Air Force commander, Hobbins deployed the 12th Air Force’s Air Operations Center to Southwest Asia as operations Enduring Freedom and Iraqi Freedom’s alternate AOC prior to the beginning of the hostilities. A command pilot, the general has more than 4,275 flying hours, primarily in fighter aircraft. A: USAFE’s history of air dominance using agile deployability and geographically dispersed forces makes complete battlefield awareness essential for success. Airmen globally engaged on the battlefield need all the connectivity, access and sophisticated information sharing that we can create. This endeavor will not only enable their success, but also help the Air Force achieve net-centric warfare. We provide the command and control and resources to capitalize on the technologies and concepts of operations necessary to achieve horizontal integration and interoperability. The eventual result will take the form of a fully integrated digital system that delivers a seamless, survivable, instant capability to execute the joint force commander’s desired effects. “Network-centric warfare” (NCW) is the future method of operating. Robust connectivity and great applications will make that happen, and the entire joint force and our Air Force will benefit from this in the future. We are always adapting to new technology and to warfighter requirements. My objective is to ensure that USAFE provides air forces that can deliver at anytime, anywhere—we can do it as a joint force commander and/or for a joint force commander, as a JFACC or CFACC. We will use information services to deal out knowledge, but first we must solve the information-discovery problem with a common data strategy. Q: What are some of your other key goals as USAFE commander? A: USAFE will remain ready to fight and postured to respond anywhere while providing superior services to its world-class airmen. Our airmen are constantly finding ways to do things better, and I would like to see them become even greater analyzers, rather than inputters, of data. We will continue to adapt to meet mission requirements, and we will do this jointly and with multinational operations. Although operating jointly has been a part of our business for a long time, the constantly changing global environment requires us to adapt and integrate more closely with our sister services. We will continue to expand our theater-security cooperation programs and support new EUCOM initiatives. I also want our command to be more engaged with NATO, other alliances and partnerships. Our relationships with our allies, our focus on interdependence with potential coalition partners, will aid our efforts in dealing with global and transnational threats. I am also taking a hard look at where we are in a historical context. We are about to field a wide range of capabilities in the USAF, and in USAFE we particularly need to focus this technology in areas where we can reduce risk. The JSF will reach IOC in 2013. That is not too far off in terms of long-range planning. We need to see how JSFs, perhaps even F-22s, Global Hawk, ROBE-equipped follow-on tanker/cargo aircraft, DCGS, AEHF and Transformational Comm. would work together to allow us to rapidly interdict a terrorist activity or deploy to a region in turmoil to stabilize the situation. Our defense strategy tells us we should first be able to deter and dissuade potential enemies from taking action against us or our allies. By fielding these new capabilities in USAFE over the next five to 15 years, we will be much better positioned to support the CoCOM as his air component. Q: How will your recent experience as deputy chief of staff for war-fighting integration and acting Air Force CIO shape your approach to your new command? For example, in USAFE, we’re working to consolidate our network help desks into a centralized call center that provides 24/7, standardized customer support to all the computer and network users throughout the command. Through this initiative we hope to decrease help desk positions by 21 percent with an estimated $1.2 million in manpower savings. We’re also modernizing our tech control facilities and base distribution systems that will eliminate current bandwidth constraints, leverage net-centric infrastructure and provide the on-ramp to the global information grid. This effort reduces our annual operations and maintenance costs by $1 million, reduces manning by 38 positions and cuts engineering and installation costs through fiscal year 2011 by $19 million. These examples provide a small glimpse into what USAFE is doing to improve our business processes and focus on enterprisewide solutions, while ensuring the warfighter has the information at the time and place of his or her choosing. Second, I will take to task the SECAF’s new focus on cyberspace operations. Not only will we protect our assets in cyberspace, we will dominate the enemy. Global connectivity is key to decision superiority in today’s battlespace. We must bring the Global Information Grid down to the tactical edge, fusing our intelligence information to produce real-time situational awareness, thereby enabling effective command and control. We can break this task down into two major groups: (1) robust and reliable connectivity [networks] and (2) smart applications running across them. We must develop both of these groups to reach our desired NCW end state. I am asking USAFE and our NATO headquarters to be a learning partner on such techno-economic feasibility report projects as tactical targeting network technology and the Battlefield Airborne Communications Node. Q: Please tell us more about USAFE. What are its resources and responsibilities? A: As the air component for U.S. EUCOM, USAFE directs air operations in a theater spanning three continents, covering more than 20 million square miles, containing 91 countries, and possessing one-fourth of the world’s population and about one-third of the world’s gross domestic product. USAFE is an Air Expeditionary Force with a mobile and deployable mix of people and resources that can simultaneously operate in multiple locations. Its role in Europe and Africa has expanded from not only warfighting to include the full range of operations from humanitarian and peacekeeping operations, to other non-traditional contingencies throughout our area of responsibility. In peacetime, USAFE trains and equips U.S. Air Force units pledged to NATO. In fulfilling its NATO responsibilities, USAFE maintains combat-ready wings based from Great Britain to Turkey. USAFE plans, conducts, controls, coordinates and supports air and space operations in Europe, the Mediterranean and parts of the Middle East and Africa to achieve U.S. national and NATO objectives based on taskings by the U.S. EUCOM commander. Approximately 39,000 active-duty, reserve and civilian employees are currently assigned to USAFE. Equipment includes about 220 fighter, attack, tanker and transport aircraft and a full complement of conventional weapons. Q: What role is USAFE playing in supporting operations in Iraq and in the global war on terrorism? A: Our number 1 operational priority is to provide expeditionary-ready forces to the combatant commanders. More than 2,600 USAFE airmen are currently deployed in support of operations in Iraq and the GWOT. Airmen that remain at home station are also actively engaged in the fight by moving equipment and resources to support the warfighter, providing crucial training, maintaining readiness, communications support and many other functions. Our airmen do their job so well, every minute of every day, that their efforts are largely transparent. However, without the Air Force, the important work in the GWOT could not be accomplished. Q: How has the stepped-up pace of operations affected USAFE readiness? A: The level of activity and the breadth of involvement in USAFE [are] simply staggering. This is an extremely busy, continuously engaged command. No matter what the operations tempo, though, USAFE warfighters always maintain the highest state of readiness. They are complete professionals. Because we are an expeditionary Air Force, USAFE forces train to an expeditionary capability and are available to react globally. USAFE forces are deployed to Southwest Asia today, and others are preparing to deploy in the future. That’s our number-one operational priority—expeditionary readiness and support to the global war on terror. Q: What new or additional air platforms would you most like to see made available to USAFE? What new technology and other equipment would be most useful? A: The Air Force has been at war for over 15 years—we’ve adapted to changing requirements and situations throughout that time. Technology is an ever-evolving continuum that we must always be examining and reexamining to stay ahead of our enemies. The aircraft that we used decades ago remain an essential part of our force. But we must find new and innovative ways to consolidate our resources and use them more efficiently. UAVs are a great example. UAVs lessen risk and provide essential battlefield data to the war fighter. The Global Hawk UAV could provide USAFE near-real-time, high-resolution, intelligence, surveillance and reconnaissance imagery. In the last year, the Global Hawk provided Air Force and joint warfighting commanders more than 15,000 of these images to support Operation Enduring Freedom, flying more than 50 missions and 1,000 combat hours to date. Another potential platform would be the Battlefield Airborne Communications Node (BACN), a significant milestone toward providing warfighters an advanced way to share critical information by communicating over airborne networks at high altitudes. As a whole, while we continually reevaluate the avenue to air superiority, we’ll also need to look at our capabilities to support it. Q: What changes have you observed as USAFE since leaving the command as director of aerospace operations five years ago? A: There are two important changes. First is the War Fighting Headquarters. Our lessons from Allied Force have been applied over the past 5 years to mold U/TASC into the AFs first WFHQ. This unit is ready to command and control the fight…right now as a CFACC or as a joint force commander, either in a fixed or deployed mode. The ability to very rapidly ramp up to operational level C2 in a developing crisis cannot be overstated in today’s fast-paced world. The next biggest change I’ve seen is the shift to more of a mobility focus. We are actively engaged in an enormous amount of missions all over the globe. USAFE is an air expeditionary force with a mobile and deployable mix of people and resources that simultaneously operates in multiple locations. Its role in Europe and Africa includes war-fighting, humanitarian and peacekeeping operations, as well as other non-traditional contingencies throughout its area of responsibility. We have world-class mobility infrastructure here at Ramstein and Spangdahlem. Q: You are also commander of Allied Air Component Command Ramstein, and air component commander, U.S. European Command. What are your missions in those positions? A: As the allied air component commander, I lead NATO airpower with flexible and responsive direction ready to meet today’s needs and tomorrow’s challenges. My mission is to ensure the security and territorial integrity of member nations within the area of functional responsibility [AOFR] through effective air policing, maintain the security of NATO nations in the NATO AOR and beyond as directed through dynamic command and control [C2] of air operations, and to contribute to the preservation of peace and the promotion of stability through operations, co-operation activities, exercises and dialogue. The Allied Air Component’s role over the past few years in the International Security Assistance Force in Afghanistan, as well as our part in the NATO Response Force, are prime examples of the NATO airpower mission in action. As the air component commander of USEUCOM, I direct in-theater air operations. I lead USAFE in planning, conducting, controlling, coordinating and supporting air and space operations in Europe, the Mediterranean and parts of the Middle East and Africa to achieve U.S. national and NATO objectives based on taskings by the U.S. EUCOM commander. Q: What is the Multinational Joint Air Power Competence Center, which you direct? A: The Multinational Joint Air Power Competence Center in Kalkar, Germany, is the first multinational center of excellence. Our centers of excellence (the other two are the Joint Fires Center of Excellence at Spangdahlem and the Joint and Combined Air Dominance Center of Excellence at Lakenheath) collectively encompass the Air Force’s expertise in joint warfighting—everything from getting our people and materiel to the fight, to controlling the battlespace above the surface of the earth, to coordinating and controlling joint firepower…this is how the USAF helps win our country’s wars. What we’re trying to do is be better stewards of our responsibility to share our knowledge and experience with our NATO and coalition partners while we continue to learn from their unique perspectives as well. We are integrating with our host nations’ armed forces, learning and training together, in everything from basic air superiority tactics to dynamic close air support exercises. Through our centers of excellence our goal is to build personal relationships at the unit level that become force multipliers when we are directed to conduct combat operations. Q: In addition to decision superiority, the goals of the Competence Center include achieving coherent effects and joint deployment. What initiatives are underway in these areas? A: The transformation of NATO has one key aim: to enhance the effectiveness of our alliance with regards to the current and future threats. The three identified transformational goals to reach this aim are decision superiority, coherent effects, and joint deployment and sustainment capabilities for NATO. The transformation objective areas include the topics: information superiority, NATO network-enabled capability, effective engagement, joint maneuver, enhanced civil and military cooperation, expeditionary operations and, finally, integrated logistics. The Competence Center is a means to improve our joint and combined security cooperation. We do not fight wars alone. We’re in a different world because we live in a coalition setting and we’re fighting on a global scale. Q: What challenges do you see in implementing such multinational projects? A: Time, funds and gaining acceptance at civil and military levels of staff are all challenges to successful implementation of transformation objectives. A: I was very humbled to be asked to continue serving our nation by leading this great command. USAFE always has had a reputation for being an outstanding and challenging command, and our reputation is based an unwavering focus on our mission. Our unbroken string of success in accomplishing our mission is due to the outstanding men and women who make up USAFE. It is a privilege to serve with the most experienced, respected and combat-ready forces in the world. USAFE Airmen are a team that makes a difference! It is an honor to be USAFE’s 34th commander.